The Allan Block Blog: Retaining Walls: Can You Use Recycled Concrete Aggregate As Backfill? 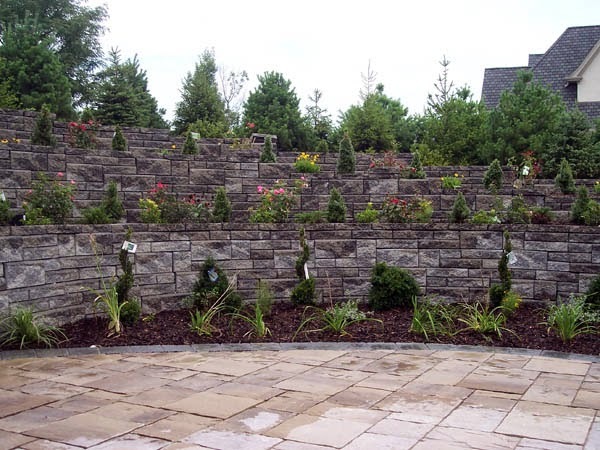 Retaining Walls: Can You Use Recycled Concrete Aggregate As Backfill? As roads are being redone and buildings are being demolished, you see an increasing emphasis on recycling the concrete instead of filling up landfills. Most uses involve crushing the concrete to use the product as aggregate. So the question is; can this recycled concrete aggregate (RCA) be used as backfill material behind an Allan Block retaining wall? The short answer in “No” unless you take the necessary design steps to manage the chemical properties associated with RCA. The reason is that the cement paste component of recycled concrete aggregate has substantial influence on the alkalinity within the aggregate. In fact, the pH levels have often exceeded 11. Keep in mind that 7 is neutral and anything over 11 is 10,000 times more alkaline than water. Therefore, you will need to make sure the geogrid used can resist the elevated pH levels and maintain its integrity.